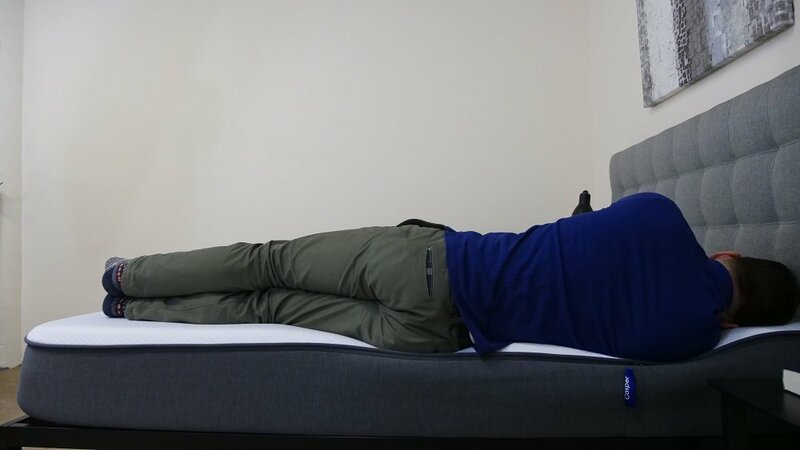 Casper just debuted an updated version of its popular flagship mattress, bolstering its pressure-relieving foam construction with a brand new layer of zoned support built to target different parts of the body in specialized ways. 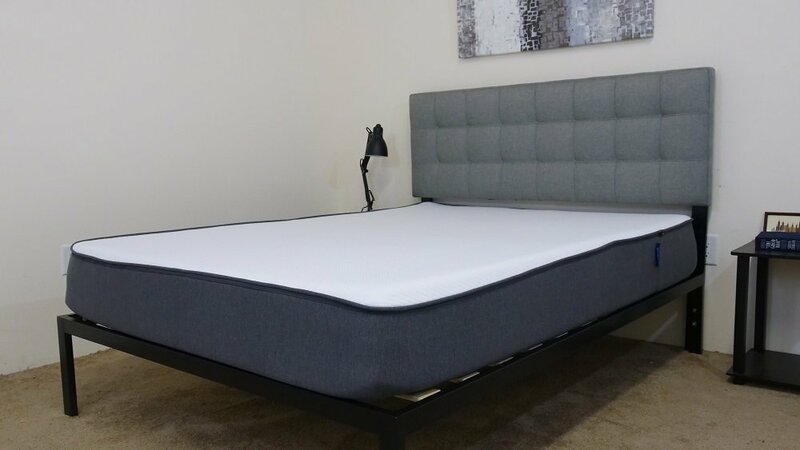 I took a look at the upgraded Casper to figure out how it sleeps and to see if it could be the perfect mattress for you! Continue reading below for my full review of the Casper mattress. Don’t have time to read it all? Click here to skip to the bottom and check out my review summary. See where the Casper landed on my roundup of the best mattresses of 2018! What Is the Casper Mattress Made of? The new and improved Casper mattress is built with four distinct layers of foam, stacking up to 10 inches. This latest iteration features an interior layer of zoned support, noteworthy in that it’s comprised of two different types of foam: softer foam for under the shoulders and firmer foam for the lumbar/hip region. The separated design is meant to bring optimal comfort to each of these sensitive areas. To see how this new section interacts with the other materials in the mattress, let’s dive into these layers. The cover is made of a soft polyester blend. It’s thick and snaps back into place quickly, which means it won’t bunch up when you move around at night. I should also note that it’s removable by zipper, so you’ll be able to clean it with the rest of your bedding. The comfort layer is constructed of a latex-like foam material that gives the bed some immediate bounce. While this section is quick to respond to pressure, it also allows the sleeper to sink in for some nice pressure relief. 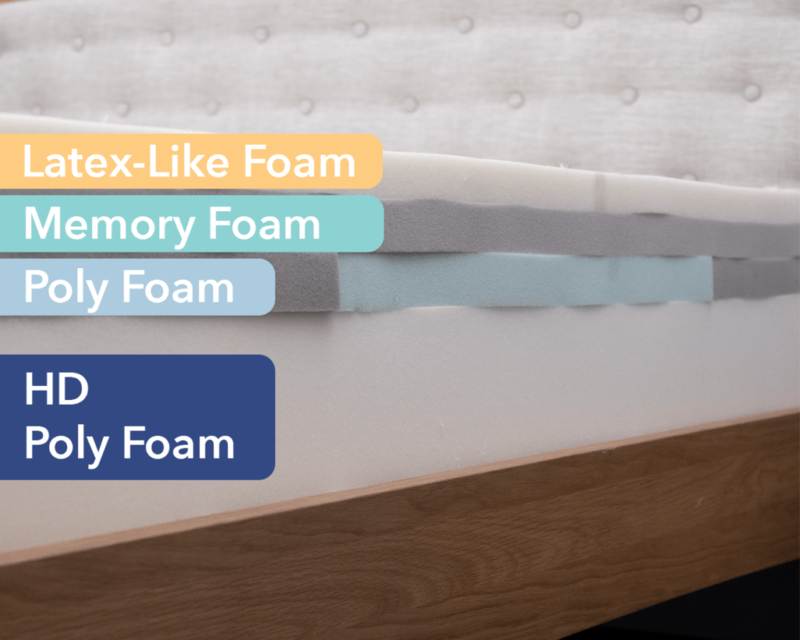 Like latex, this proprietary foam also has great cooling properties, ensuring that the bed won’t sleep too hot. Below the comfort layer, you’ll find a section of memory foam. This material produces a classic body-contouring feeling while also extending the pressure relief of the top layer into the rest of mattress. The third layer down is where we find the zoned support mentioned above. It’s built with two types of durable poly foam, with the softer variation located at the ends of the bed and the firmer one situated in the center. This placement is meant to aid with pressure relief and support, which we’ll explore later in the review. The base of the bed is made up of heavy-duty poly foam and gives the mattress its structure. Note: While the construction of the Casper mattress is different in the UK, the mattress is made with the same layers in the U.S. and Canada. Is a Casper Mattress Firm or Soft? After taking a look at the construction of the Casper, let’s chat about the firmness and feel. I started off by applying some light hand pressure to the mattress, and the first thing I noticed was the gentle bounce of the comfort layer. Pressing in further, I felt a bit of contouring from the memory foam layer, but nothing that made me feel too stuck in the mattress. At this point, I’d like to note that people of different body types and shapes will feel firmness differently. Rather than giving just my opinion on the overall firmness level of the Casper, I enlisted three other people to give their opinion as well. This will give you a better sense of the firmness range you can expect from the mattress. 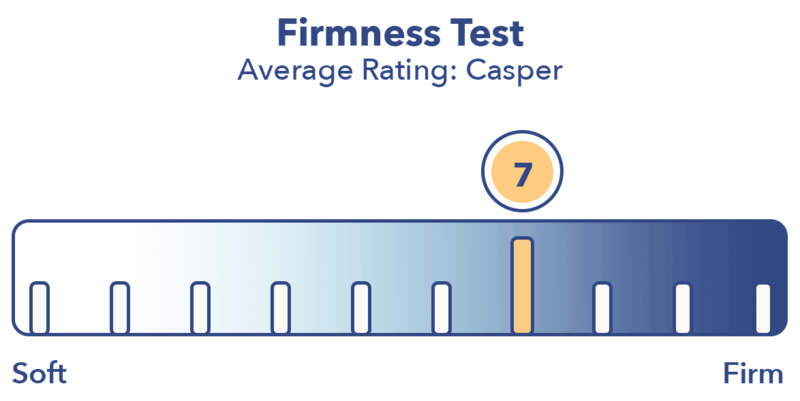 As you can see in the graph above, my testers were pretty much in agreement about the firmness of the Casper, giving it an average rating of 7. When compared to the industry standard of 6.5 for medium firmness, it seems that this bed is just a touch above medium firmness. I personally gave the Casper a 7. 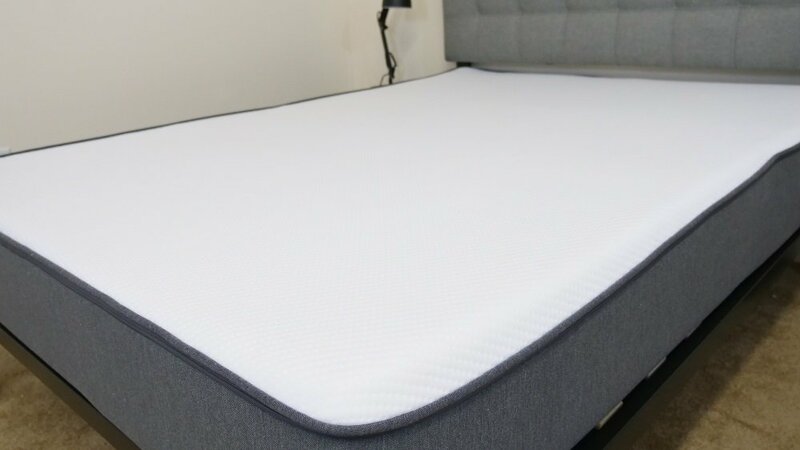 While you will feel some nice sinkage from the top comfort and contour layers, the zoned support and heavy-duty poly foam layers help to lift the sleeper up and out of the bed. This means you’ll feel like you’re sleeping on top of the mattress as opposed to in it and won’t ever feel too stuck. This is ideal for those who doze in multiple positions, as the bed’s bounce will make it easy to toss and turn as you like. Rather than just describing the feel of the Casper to you, I wanted to give a visual representation of where someone may feel pressure points form while lying on it. To do this, I placed a pressure map on top of the mattress and lay on my back, side, and stomach. 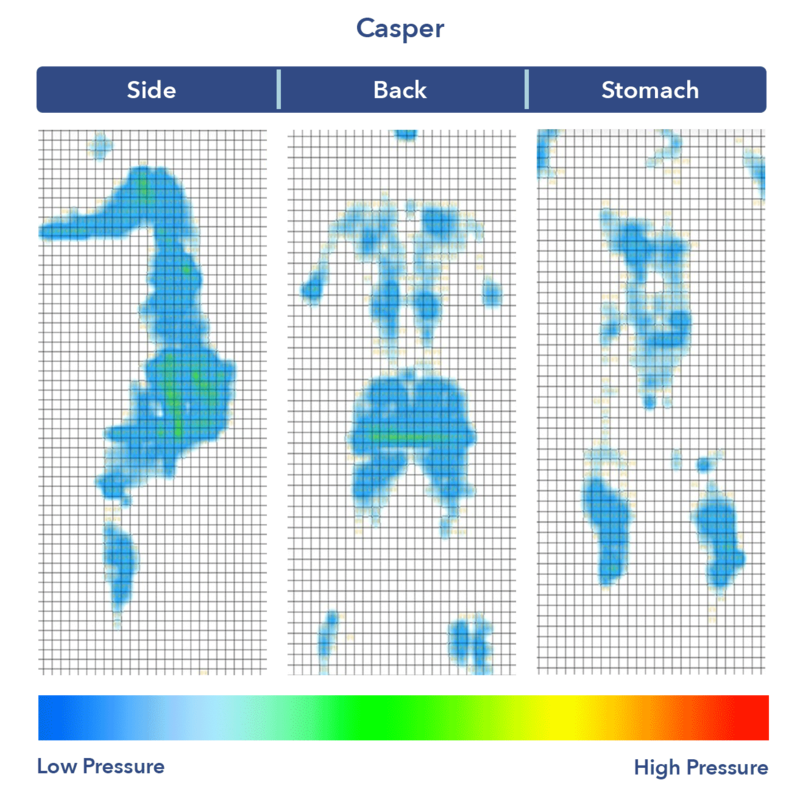 You can see the results on the image below where pressure is represented from blue (low pressure) to red (high pressure). Back: Lying on my back, I felt a lot of great pressure relief from the mattress. The zoned support helped to fill in the space at my lower back and provided a pleasant lift to my lumbar region. Side: Turning over to my side, I continued to feel secure and comfortable. As you can see in the graphic, the zoned support alleviated the formation of pressure at my shoulders and hips by cradling them in the specialized foam. Compared to the older version of the Casper, this is a marked improvement that will satisfy a wide range of sleepers. Stomach: When I rolled onto my stomach, I thought the bed did a great job of keeping my spine in a healthy alignment, with my shoulders on the same plane as my hips. I should mention that it was very easy to switch between all three of these different positions. 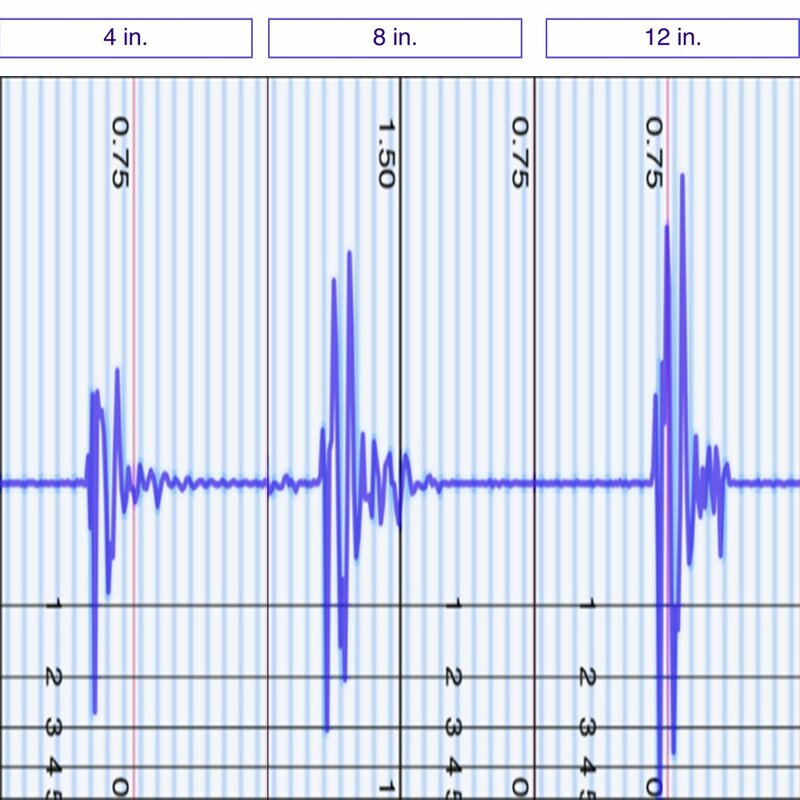 To illustrate this motion transfer, I dropped a 10-pound steel ball from heights of 4 inches, 8 inches, and 12 inches and measured the disturbance it caused: The bigger the lines, the bigger the disturbance. 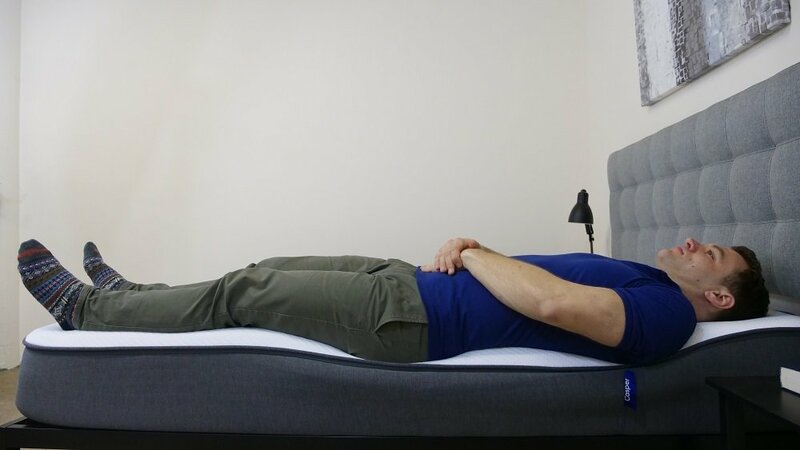 The Casper shows an average amount of disturbance for the 4-inch drop, which simulates someone rolling around and adjusting their position on the other side of the bed. The 8- and 12-inch drops show larger spikes in movement, but nothing too extreme. This tells me that the bed is fairly average at containing motion, which is to be expected from an all-foam bed. So while you’ll probably feel your partner as they toss and turn in the night, it won’t be anything too disruptive. When buying a new bed, most people want to know whether they’ll feel like they’re sinking into the mattress or laying on top of it. 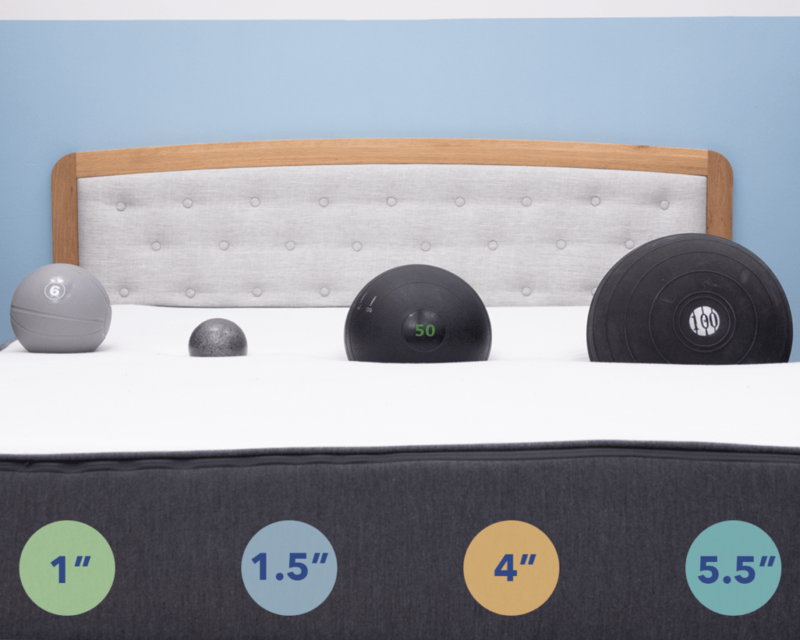 To visualize this sinkage, I placed four balls of varying sizes and densities (a 6-pound medicine ball, a 10-pound steel ball, a 50-pound medicine ball, and a 100-pound medicine ball) on the mattress and measured how much they compressed the surface. The variations in size, weight, and density are meant to simulate different body parts and different-sized sleepers. This was honestly less sinkage than I was expecting from an all-foam mattress, but it’s not that surprising when you consider that the balls were placed on top of the firmer section of the zoned support layer. Even for this placement, it’s clear that this layer coupled with the poly foam base imbue the bed with a buoyant lift, situating the sleeper on top of the mattress as opposed to in it. This is great for a wide range of sleepers but especially beneficial for back and stomach sleepers. Lying on my back, I felt well-supported at the side. The zoned support did a great job of making me feel as secure at the edge as I did in the center and ensured that I wouldn’t roll out of the bed. Rolling onto my side, I continued to feel secure at the edge. While there was some light compression through the top foam layers, the zoned support once left me feeling solid. In this position, I wanted to simulate what it would feel like to be sitting on the bed in the morning when you’re lacing up your shoes and getting ready for the day. A lot of foam mattresses experience severe compression in this position, but the Casper actually held up very well. If you’re convinced the Casper is the right mattress for you, the size and pricing information for the mattress are below. Please note that these prices reflect standard pricing, but you can get $75 off with the coupon code SLEEPOPOLIS! What’s Different in the 2018 Update? Zoned Support: The biggest change is a structural one, with the added interior layer of zoned support. As you’ve surely noticed in the review thus far, this section targets specific parts of the body in different ways, ensuring that the pressure relief is felt all the way from your head to your toes. Ultra-Supportive Foam: I also perceived a new feel from the mixture of foams, namely that they do a fantastic job of marrying support with sinkage. While the original Casper did this pretty well, I think the update achieves an even better balance between the different materials. Is a Casper Mattress Worth it? Now that we’ve taken a closer look at the Casper mattress, it’s time to discuss who it’d be a good fit for. Purchasing a Casper mattress is worth it if you want a balanced foam feel, targeted support, and heat dispersion. Zoned for Support: If you experience discomfort in your shoulders and hips, you might benefit from Casper’s zoned support layer. This section targets these problem areas in different ways, creating pain-free sleep. Balanced Foam Feel: If you’re looking for a balanced feel, look no further than the Casper. The memory foam, latex, and heavy-duty poly foam work together beautifully in this bed and contribute to a satisfying sleeping experience. Sleeps Cool: If you have issues with sleeping too hot, this could be a great mattress for you. The proprietary foam in the comfort layer provides some excellent cooling and helps to dissipate the heat from the memory foam. For more information on the Casper, visit its website here! Logan, I’m so glad I found you. I am in need of help. We traded our king The Original Mattress Factory for a king JoyBed, and I’m not sure I like it. My back and neck feel better (YEAH! ), and there’s less motion transfer than before (yeah! but still some), but I wake up with dark circles under my eyes and not feeling 100%. I am 5’5″ 120 lb. and hubby is 6’1″ 180 lb. We sleep hot (JoyBed has been nice and cool), we have bad backs (JoyBed has been great for that), I rotate from back to side to stomach during the night, and hubby sleeps on his side (JoyBed is HARD). HELP! I’m 60+ days into the JoyBed experience and I just don’t know if I can keep it. I’m considering buying 2 Twin XL to thwart the motion transfer problem we experience. We’re getting old and like our sleep! I just want a better night sleep, to sleep thru the whole night, and to wake up back-pain free. Should I buy a Casper? 2 Twin XL or 1 King? Buyer beware!!!! Don’t fall into the same trap that I did. I recently purchased a Casper mattress upon the recommendation of my daughter. It was delivered and set up because I paid a $150 delivery/set up fee. I am not at all happy with the mattress. I am having it returned a week later. There are no brick and mortar stores in my area in NW CT. The closest retailer is either NYC or Dedham MA. Hence, I purchased the mattress completely sight unseen, without a test trial. I have learned that the set up and delivery fee is non refundable. Nowhere in the ordering process was this highlighted, underscored or emphasized to me. Check your phone records from my order and listen to the taped interaction if you must. But it was not stated that this would not be a refundable expense. I spoke with one of your supervisors named Julia who was adamant and unyielding stating that “It has been completed’ and ‘was a service rendered’ and that she would ‘funnel; this information over to her team to make ‘our language’ more ‘explicit.’ This is just ridiculous. You have all the ostensible bells and whistles of being a lovely company but when it comes right down to it, your customer service is as hard and unyielding and disappointing as is your firm 4 layer mattress. You have lost a customer as well as a source of a positive reference. Enjoy your $150!!!!!!!!! I know this mattress has great reviews but I found the mattress to be different. If you’re sharing your bed you WILL feel them slightly move. If you share, this mattress is not for you. He stated that it was the “new and improved “ version. It is called “The Casper Mattress”. It is the middle model. 10inches, as stated.. The Basic is not 10inches. The Wave is the 3rd, top of the line, all white mattress. I could really use your help. I have been going through your site fairly intensively and I am now at the following dilemma. I have purchased both the firm and medium firm versions of the Loom and leaf. Neither have worked out for me. The firm really hurt my neck and shoulders and the medium firm took away the neck and back pain but now my hips sink in too much. I am a back and sometimes side sleeper. In addition, my girlfriend is a stomach sleeper. She would prefer the firmest bed I could find. I am considering switching to the Zenhaven from Saatva which is all Latex and I’m thinking firmer and having greater response with less of a sink in feeling and I am also considering the new Casper. Do you have any advice that would work for both of us? Help please. You mentioned upgraded versions of The Casper. How do you know you are buying the newer version? I really appreciate the zoned support. With a lot of lower back pain, I need all the help I can get. Hey Cuz….do you love this mattress? We’re considering one. I suffer from back issues from my thoracic area to my lumbosacral area and presently have a firm mattress on an adjustable bed base as I cannot lay flat. Is this mattress suitable for an adjustable bed? I’m 4’10” and 232 lbs. I want something that give support all the while feeling cozy and softer than what I have now. Thank you for your time. I don’t see any information on the Casper Wave. Where do I find that? I’m a side sleeper with lower back problems. I’m curious about the Casper mattress after your comprehensive review. Details about me: 5’10”, 175 lbs, male, back sleeper. I have a history of intermittent lower back pain and a mattress that will give me excellent support. We are replacing a full-size Posturpedic Cushion Firm Pillow Top mattress after only three years due to:  Back aches in the morning,  Sleeps hot,  Hard to move around and  Difficult to stay asleep. 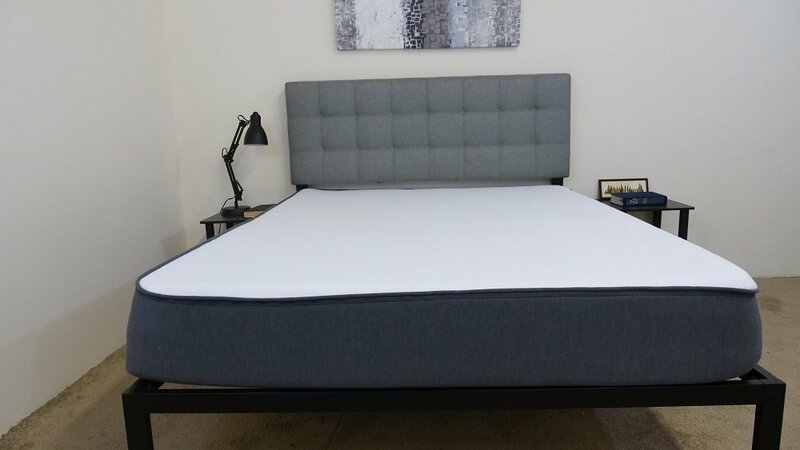 After watching and tabulating the data from your reviews on seven mattresses, as well as visiting a mattress store to try various designs, we have zeroed in on the Casper to resolve these issues. We are both seniors, side sleepers with BMIs of 24.0 and 30.5 and need to find a suitable replacement mattress. What would you suggest? 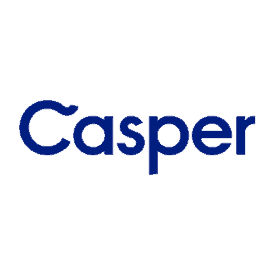 Is Casper Mattress okay for a young child of 3 years old? I would appreciate your advice for my daughter’s first bed mattress. How would it hold up to a 6’4″ 380lbs sleeper.. Which Casper mattress was this review on? The Wave is seriously out of my price range. I am interested in which model this was. Thanks. Thanks for the casper mattress review, it looks impressive to me.